If you’re looking for a convenient, well-designed one-cup coffee maker, you won’t be disappointed with the Cuisinart DCC-3000. 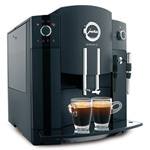 This model has a 12-cup capacity, but you can program it to dispense just one to four cups if that’s all you desire. With no carafe, you don’t have to worry about much cleaning; in addition, the side water tank means fewer spills. The coffee maker has a self-cleaning feature that cuts down on calcium deposits; it also lets you know when more hands-on maintenance is required. We especially appreciated the light under the dispenser that lets you see how much coffee is in your cup so you don’t overfill it. The coffee tastes great, too, and stays hot for hours. The Cuisinart DCC-3000 is available for $99.99. This one cup coffee maker doesn’t use K-Cups like a lot of the ones on this list. The Bunn MyCafe MC uses coffee pods that resemble tea bags. They are compostable, which reduces the waste associated with K-Cups. That’s a big plus if you want to go this route and are concerned about the waste you create. The machine uses jet sprayers and pulse options to get the best out of every single cup you brew. Bunn also knows temperature is important and made sure every cup gets brewed at 200 degrees. 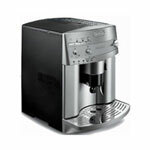 The Bunn MyCafe MC can be found for $100.95 to $119.99. Keurig is the original K-Cup brewer, so they are going to do it right. If you are into the K-Cup brewing craze this is one of the top tier one cup coffee makers on the market. This unit has a delay start so you can program when you want it to turn on and begin its warm up process. If you set it to be ready for you in the morning, you can literally have a hot and fresh cup of coffee in one minute. Just pop in a K-Cup then start it. That’s all. Who knew your morning coffee could be so fast and easy? This one is a little on the expensive side, but it has many options that make it worth it. The 5 cup sizes are a huge plus compared to some of the others that only offer one smaller size. 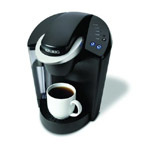 The Keurig B70 can be found on sale for $157.99 to $179.99. This one cup coffee maker from Cuisinart looks like it has come right out of a coffee shop. You’ll think so when enjoying every fresh cup of coffee that comes out of it too. This is another K-Cup machine, but it has a great brand name and lots of features to make it appealing. It has 5 cup size settings, an included reusable filter for regular ground coffee, a dedicated hot water button, a charcoal water filter for the best tasting drinks, and Quiet Brew Technology keeps things calm in the morning. All of these come together to make one great machine. You can find the SS-700 on sale for $164.00 to $199.99. Yet another K-Cup brewer in the one cup coffee maker mix. Why is this going to be one you should consider? 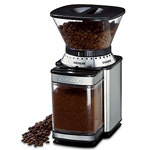 The KG5 from Mr. Coffee is a perfect balance of price, features, and simplicity. You get some of the features the cheaper machines don’t allow like choosing a 6 or 10 ounce cup and a 24oz reservoir that lets you make multiple cups without refilling the machine. This is not going to be a machine that brews for the whole family, but for 1 or 2 people it is going to be perfect. You can get the Mr. Coffee KG5 for $79.99. The B40 Elite Brewing System is a pretty great one cup coffee maker. If you aren’t the type who drinks a whole pot of coffee over the course of the afternoon, this is the machine for you. Once you let the machine prime for 4 minutes, you can have a hot cup of coffee or tea in less than a minute. Keurig (who makes the K-cups) says there are over 70 choices of K-cups to choose from. This would be great for the couple who drinks different drinks in the morning too. Coffee for him, tea for her. This coffee maker is available for $120. 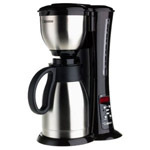 The Mr. Coffee one cup coffee maker is one of the best bargains on the list. It is hard to find a decent K-Cup brewer out there without spending more than $100. This one comes in well under that if you pick it up from the right place. This one may be lacking some of the extra features, but it makes a good cup of coffee in the end. This unit is limited to an 8oz brew, and that is probably the most limiting thing about it. Like all K-Cup brewers, you have a huge assortment type available. It should be easy to find one that works for you. You can get this Mr. Coffee machine for $54.95 to $59.99. Hamilton Beach came up with a very neat idea for a one cup coffee maker. The first thing you will notice is the scoop for a filter. Very cool idea. Just scoop your coffee, put the scoop in the machine, then brew your coffee. The unit drips right into your travel cup or mug so you don’t have a carafe getting dirty. The cup size is a bit small, but it is ready in less than 2 minutes. 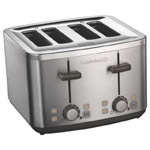 Hamilton Beach also made sure the temperature of the finished product was right. Hot coffee is very important to many people and you know you are going to get that with this coffee maker. You can find the Single Serve Scoop for $59.00 to $69.99. Two good things immediately stand out when looking at this one cup coffee maker. You can get it very cheaply and it comes with its own travel mug. Many of us are constantly on the go, we like to have a hot drink while we commute, and we don’t want to pay hundreds of dollars a month on Starbucks. That’s where this little machine comes in handy. It’s not the flashiest or the best, but it will keep you happy in the morning. You can pick the Black & Decker Brew ‘n Go up for $19.99.